Charlotte Harbor & the Gulf Islands, Fla. (January 27, 2104) – Twenty top meeting and event planners have been adopted by the Charlotte Harbor Visitor & Convention Bureau in the new “Adopt a Meeting Planner” program. Every two months, each planner will receive an ‘Old Florida’ style suitcase-box with a gift from a local business and a letter from the Visitor & Convention Bureau highlighting the area’s amenities and other relevant information. Charlotte State Bank & Trust was the first area business to participate. The bank created a photo book showcasing Punta Gorda’s beauty, charm, historical sights, dining, meeting facilities and events. The suitcase-boxes containing the books were shipped to planners in early January and the Visitor & Convention Bureau has already received a letter of appreciation from one of the recipients. VISIT FLORIDA, the state&apos;s official tourism marketing corporation, reports each business traveler to Florida spends approximately $244 per day and meetings account for 12 percent of visitation to the Sunshine State. Five other “Adopt a Meeting Planner” mailings are scheduled for 2014. The Charlotte Harbor Event & Conference Center, Fishermen’s Village, Harbor Style magazine, Palm Island Resort, and the Visitor & Convention Bureau will each adopt one of the remaining months. 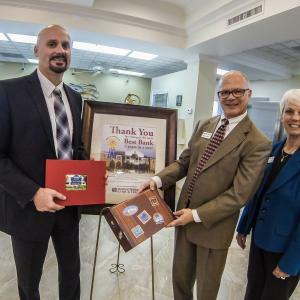 Charlotte State Bank & Trust is the first Charlotte County business to participate in the Charlotte Harbor Visitor & Convention Bureau’s “Adopt a Meeting Planner” campaign. Pictured from Charlotte State Bank & Trust are Mr. Craig DeYoung, President; Mr. Don Martin, Marketing Director; and Ms. Nancy Padgett, Community & Business Liaison. Located halfway between Tampa and Naples on the Southwest Florida Gulf Coast, Charlotte Harbor & the Gulf Islands is a charming collection of nine coastal communities surrounding the state’s second largest harbor. Florida’s premier year-round eco-tourism destination, Charlotte Harbor & the Gulf Islands offers a pristine unspoiled beauty that has served as the backdrop for seven major feature films as well as countless memorable vacations. A haven for outdoor enthusiasts, Charlotte Harbor & the Gulf Islands has been named one of SAIL magazine’s “10 Greatest Places to Sail in the United States,” ranked by Golf Digest as “Third Best Place to Live and Play Golf in America,” and rated by MONEY magazine as one of the “Best Places to Live in the South.” The city of Punta Gorda was named in one of “Top Ten Places to Retire Healthy” by U.S. News & World Report. Englewood was named second of the Top Ten emerging travel destinations in the U.S. by TripAdvisor.com.